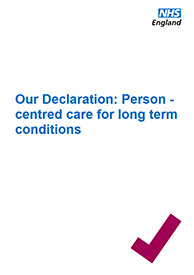 Our Declaration sets out the importance of person centred care for people with long term conditions, what needs to change and why we need to change. It was developed for and with input from health and care professionals, policy makers and people with long term conditions. The coalition for collaborative care hosts more information about Our Declaration including the story of how it was developed, the case for change and what steps NHS England has taken to meet the challenge it sets out. The case for change and motivation for the increased focus on person centred approaches are explained in National Action for Change.